A tasty (and healthy) snack we serve with our Full Service Spirits, Beer & Wine Bars! Try some of our refreshing tea blends! Your guests will love the novelty of this chilled treat served in a corked globe! 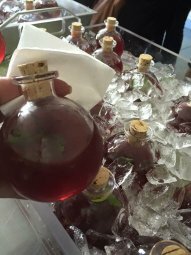 Thanks to Mary Crafts at the AOCF Conference for this brilliant beverage presentation! Tis the season for Tailgating! Are you ready for some football? We love catering tailgate parties! Whether it be in a parking lot, on a rooftop, in your man cave or in your living room — we specialize in Twelfth Man parties! Earlier this month we attended The Art of Catering Food Conference in Salt Lake City. It was a great learning experience! Our Head Chef was able to get some hands-on time with amazing chefs from around the country, we toured the new facility of the award winning top caterer in Salt Lake City – Culinary Crafts, added some delicious new recipes to our repertoire and ended the week at the Boots & Buckles Industry Party hosted by Culinary Crafts! Take a peek at our Head Chef, Shayne at the Hoe Down – Yee Haw! To our loyal customers it is an honor to be called “your caterer” and to our new clients – we are here to serve and look forward to working with you! A quick reminder to give us a call soon to book your Holiday Party while we still have some open dates. GAEC is a leader in our Industry — Our own, Kris Brown was a panelist at the AOCF Conference in SLC! Speakers on this panel were from small, mid-size, and large companies sharing proven tips & systems for developing a highly functioning team. 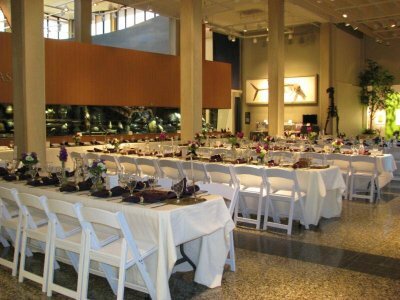 Green Apple Events & Catering is a Preferred Caterer at the very distinctive venue ~ The Burke Museum. Crunchy and salty are the two things that make a perfect bar snack. 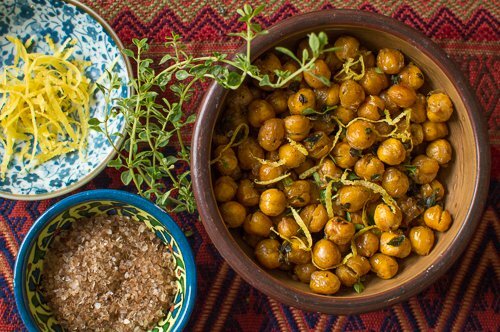 These baked chickpeas are not only tasty but also a healthy snack full of protein. Just toss them with a little olive oil and some spices, then roast in the oven until crunchy. They’ll stay crispy for a few days stored in a resealable bag at room temperature. Place the chickpeas in a large bowl and toss with the olive oil, sweet paprika and smoked sea salt until evenly coated. Spread the chickpeas in an even layer on a rimmed baking sheet and bake until crisp, about 30 to 40 minutes. Remove from the oven and toss with the lemon thyme and lemon zest.